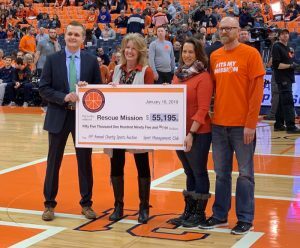 On Jan. 18, 2019, the Sport Management (SPM) Club at Syracuse University announced it raised $55,195 for the Syracuse Rescue Mission at its 14th annual Charity Sports Auction. The event took place Dec. 1, 2018, in the backcourt of the Carrier Dome during the Syracuse University men’s basketball game vs. Cornell University. The SPM Club is a student-run organization in Falk College’s Department of Sport Management. The 2018 total was the third-highest in the 14-year history of the event, which has now raised $467,233 for local charities. During the auction, bids were placed on more than 475 items, including signed sports memorabilia, tickets to sporting events, gift baskets, car services, furniture, gift certificates, trips and jewelry, among others. “The Rescue Mission is excited and grateful to have been chosen as the nonprofit partner for the 2018 Sports Management Club Charity Sports Auction. The proceeds from this event will remain local right here in Syracuse and Upstate New York, and will directly serve those in need through safe beds and warm meals,” said Chief Executive Officer Dan Sieburg. Since 1887, the Rescue Mission Alliance has been fighting to end homelessness and hunger across Upstate New York, with operations in Syracuse, Auburn, Ithaca and Binghamton. Their mission is to share hope, end hunger and homelessness, change lives, and strengthen communities, one person at a time. In 2017, the Rescue Mission served more than 282,000 meals and helped over 10,000 men, women and children in need in the community. For more information about the annual Charity Auction, follow us on Twitter at @SPMAuction, Facebook and Instagram at @spm_auction, and visit the Syracuse University Charity Sports Auction website for the most up-to-date event information.